The defunct brewery in which this museum is housed was built in 1930, an example of modernist industrial architecture. Today it has been transformed into an international contemporary art center. There are no permanent exhibits. Most exhibits focus on both art, visual arts and architecture. Specifically the museum likes to examine the points of interaction between various creative and artistic disciplines. There are about three floors of exhibits. Check the museum website for current and upcoming attractions. Check out the cafe-restaurant and the bookshop. 7 € Seniors +60, groups of 10+, disabled. 4 € Students (12–18), schoolgroups, unemployed. Free for under 12, first Wednesday of the month. Special exhibitions and programmes may have their own prices. Trams 32, 82, 97; Buses 49, 50, N12 stop Wiels. How popular is W I E L S? People normally club together Porte De Hal and Horta Museum while planning their visit to W I E L S.
The lobby/restaurant is he former brewing place of Duvel, you can still see the big brewing kettles. The exposition spaces are quite spacious. At the very top of he building you have a wonderful outlook of the city. Oh and this place also has the best artistic bookshop of Brussels. Not because it's the biggest, but because they have books of lesser known artists and inspirational books for artists and creative people. An interesting contemporary art show. You can see several artists on different levels of the beautiful building which has been retranformed from a beer factory into a new museum/ gallery. They also have a small restuarant and bar there. Its a great way to spend a cultural afternoon with a couple of friends or even with children. Several events and conferences, workshops. Fantastic building. Great cafe for a drink or snack. All ways some thing worth visiting there. Great views of the city form the roof top. 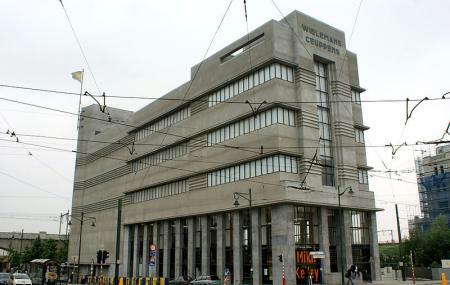 The best place for contemporary arts in Brussels. And interesting architecture.